When I turn to a white Burgundy I look to enjoy a wine that is crisp, lots of minerality and great fruit but not a lot of oak. 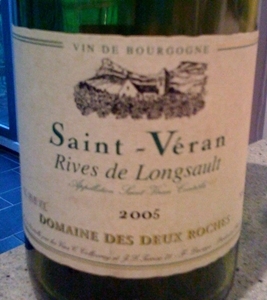 Unfortunately the 2005 Domaine des Deux Roches Saint-Veran “Rives de Longsault” ($20) did provide, in my opinion, a bit to much pure oak aromas and flavors than I would have liked but not enough to put me off. Saint-Veran was granted AOC status in 1971, and Domaine des Deux Roches is one of the finest producers in the area according to many experts. preserve the freshness of the fruit and express the best soil expression. After alcoholic and malolactic fermentations we age our wine on fine lees until April.” I am not sure if only 30% remained in oak or if all of it went in after primary fermentation and what percentage was new versus used barrels. I imagine that it was a good percentage of new oak as I am to overly sensitive to the “Oak Monster” as Gary Vaynerchuk calls it. As far as structure goes I think this is classic Burgundy, but again the predominance of oak at the front end of both the aroma and flavor profile surprised me. The rest of the flavors were very layered and came through quite nicely despite the oak presence. The acidity and minerality were fantastic and this would make a great pairing for shellfish. If you are a fan of Burgundy but would like a little more “new world” oak influence give this one a try, although in doing some internet searching I didn’t see too much of the ’05 out there, mostly ’06 and ’07. The 2008 Kim Crawford Unoaked Chardonnay was good but not great. There isn’t anything bad I can say about it but the fruit was all rather muted both on the aromatics as well as the palate. Honestly it drank more like a big Pinot Grigio than an unoaked Chardonnay. I am a big fan of Kim Crawford Sauvignon Blanc and Pinot Noir but this one just missed the mark for me. Especially for the price, there are tons of great unoaked options out there from the United States as well as Australia or even Chablis. In its 6th vintage of their Early Wine, Macari Vineyards taps into their Austrian heritage to produce this Chardonnay that is bottled and released within a month and a half of harvest. Macari Vineyards, established in 1995 and located on the North Fork of Eastern Long Island has 180 acres of vines on their 500 acre estate. Growing a bit of everything, it looks like their primary wine focus is on Chardonnay, Cabernet Franc and Merlot. The 2008 Early Wine Chardonnay ($16) is as I said a quick to market wine similar to Beaujolais Nouveau. The 2008 was harvested on September 9th, bottled on October 16th and released on October 23rd. The result is an “interesting” Chardonnay that if I had tasted blind would have thought it to be a Sauvignon Blanc. It is a very refreshing wine with sharp acidity and a slight effervescence on the tongue that would be a great summertime sipper. Unfortunately it is meant to be drank early, so summertime is about 8 months out for this wines prime. Luckily it was an unusually warm day in Richmond last night so it felt a bit like summer. The wine had a nice tartness to it and seemed to have a bit of residual sugar that evened that out a bit. The website for Macari didn’t have the specs on the wine so I am not sure if I am correct on my R.S. assumption. At a case production of a little over 1700 cases, Macari says this sells out fast upon release and seeing this in your local grocery story is probably unlikely unless you live in the New York area. Actually this wine may only be available at the winery but don’t quote me on that. Thanks to Macari for sending me a bottle as I wouldn’t have been able to try it otherwise.